The Third part of the fan album series is coming on Xmas! The details are coming very soon. Here is a new song called Gold. Robbie gives an opportunity to choose the better version (Mix 1 or Mix 2). It's a big reference to John Hughes movies (The Breakfast Club, Home Alone, etc), Simple Minds and 80s. Surprised he releases a third one now. the first installment allegedly sold 300,000 copies via his website. You know, Robbie has hundreds of unreleased songs so he can calmly release new music nowadays: in a Stream-era he has an advantage vs many artists to release new music more often. As he told last year he already has songs for Vol.3, Vol.4 and Vol.5... Nobody believed but here it is. Also since 1997 he and his management had started to use a smart strategy: to release something fresh each Xmas period and for 21 years they do it almost annually (excl.2007/2008/2015). Anything but for reminding about 'Robbie Williams' brand to everybody. Seems in 2019 he is going to release his Christmas album with only original songs. I just checked vol 1 . Many songs are missing or? The UTR albums are the new albums with only unreleased songs. They are not the compilation albums of b-sides or soundtracks which have already been on other releases (OST, singles, etc). Technically UTR albums are fully new albums with songs which nobody listened previously. - more experimental songs because these albums are specially for fans, not for public listeners. 80% of songs on this series were recorded recently (during last solo albums sessions) and there was no space for them on his traditional album, 20% of songs were recorded 5-10-15 years ago but weren't published. In the past, before Itunes era Robbie always released a lot of b-sides on his singles. During Itunes it wasn't profitable. But because Robbie is always in an active process to write new songs he has collected a lot of songs which just sit in his laptop or something. He and his management tried to find the way how to release these songs anyway and Under The Radar series is his attempt to publish his new b-sides material in a modern music era. So it's a really good and generous idea, especially for fans. It's a luck to be his fan, considering how much different music he releases. Can't wait for volume 3. 1 was better than 2 for me, but both are great. Yup, Robbie has always been pretty generous to his fans song wise but what I loved about the UTR series is that instead of us judging the songs on their b-side status, it’s a way of making the songs singular and judged in a much fairer way imo. Robbie gives to fans one more try to make a choice of better mix for another new song - Indestructible. Now Robbie gives an opportunity to choose one of two different songs (Love Attack / The Impossible): one of them will be on the album. After months of anticipation, we can finally reveal that Under The Radar Volume 3 will be released on 14 February 2019 and is available to pre-order now! The third instalment of Robbie's fan special series, this album is another collection of previously-unreleased songs that never made it on to a studio record, but Robbie wanted you to hear. 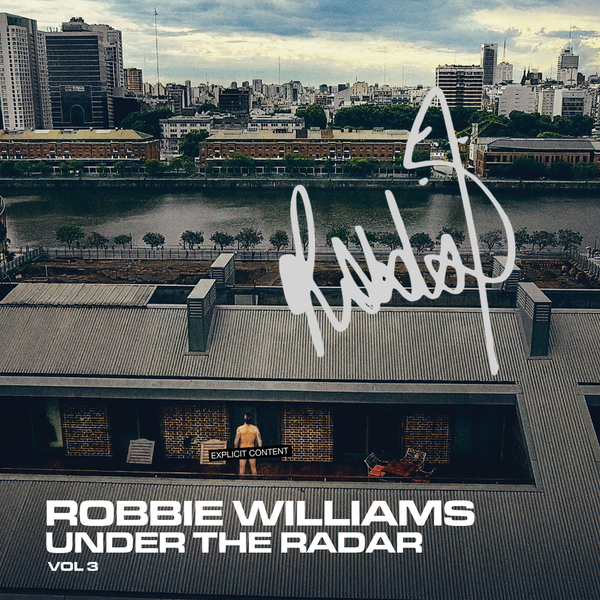 Under the Radar Vol 3 features songs chosen by fans. The final track listing will be announced following the results of Robbie’s Vloggie Williams song polls. Yeah, there is a little delay due to quantity of his projects at the same period (new child, THES Tour, Xfactor, some activity with Take That, preparing to Las Vegas shows in March). + next week the new single with Bob Sinclair will be released (not from UTR v.3). I suspect he’s pushed it back because there’s no new album coming in 2019 either. Maybe you're right but we will see. + maybe XFactor again & David Walliams' musical with OST by Guy Chambers and Robbie (technically it's a new album as well). I’m still expecting him to celebrate his 25th year as a solo star in 2021 and to go on the road with a greatest hits show. So I’d like another studio album before then. I love the idea of a Christmas album - I can see him doing some shows at The o2 or Royal Albert Hall - and it would be easier to do than write a full new album and tour it around the world. A Christmas album (with original and covers) can cover him for 2 years if he re-issues it (like Kylie) and that - with maybe UTR4 - could see him through to 2021. But I digress. I hope we get videos for UTR3. According to Rob he has already written about 20 new original Xmas songs and just don't know how and when to release them. Because people do want to listen only covers. I can't wait for this, the second volume was INCREDIBLE!